When powering on the Grundfos Magna3 Pump there are some basic settings that must be applied before initial use. The integral controller and onboard screen guides the user through each step and once complete the pump can be started in AutoAdapt Mode. To use the other control modes additional settings are required (links to Home Screen Set up, Constant Temperature Mode, Flow Limit). The Grundfos Magna3 Pump packs all of Grundfos’ innovation into a small, intelligent circulator. The integrated controller, temperature & pressure sensors and communications capabilities make the Magna3 the ideal pump for hydronic loops and Domestic Hot Water Return applications. The Grundfos CR Pump utilizes a Cartridge Style Mechanical Seal, allowing for quick and easy maintenance. A crucial step in the seal kit change process is to set the gap height for the stack kit inside the pump housing when coupling to the motor. Proper spacing ensures the stack kit will not rub on the pump housing. The Grundfos CR pump is ideal for Pressure Boosting applications. Like all centrifugal pumps, the CR cannot operate when air is trapped in the impellers. To eliminate air from the Pump, use the bleed screw on the top of the pump can, it may take several passes to clear all the air from the pump. 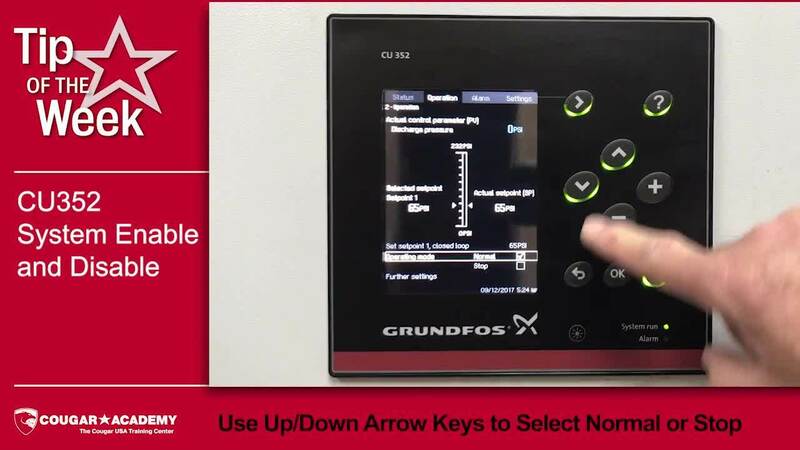 The System Enable & Disable Feature on the Grundfos CU352 Controller allows the Pump System to be shut down without having to power down. This is helpful when pump or system maintenance is required. We also recommend using this feature to disable the pumps anytime the power needs to be turned off. This protects the VFD’s and motors from losing power while under a load condition.